“Going Green” is a catchphrase that many companies have resisted. However, companies that have incorporated energy conservation into their warehousing are raising their bottom -line profits each and every day. Why? Because energy costs money, and if you’re saving energy, you’re saving money. The limiting factors, however, have been and continue to be the up-front costs, and calculation of a true R.O.I. for each energy- and resource-saving initiative. Although the government has not yet mandated conservation efforts, it is plain to see that we are headed in that direction. With the world’s population increasing, more automobiles in production, and more countries establishing themselves as manufacturing and service sources, the United States will likely play a pivotal role in the world’s direct approach to energy and resource conservation. Getting on the bandwagon now puts companies at the forefront and allows them to spread the costs of implementation over many years. Going paperless – Some companies have gone as far as to removed file cabinets and printers from their offices. The money and waste saved simply from ink and paper can easily run into tens of thousands of dollars for the typical medium -sized office. Consider Electric Forklifts – If you haven’t checked out the benefits and improved performance of electric forklifts, there’s never been a better time. With Toyota’s new 80V forklift, replacing old, internal combustion engine forklifts is a possibility for many companies. Cleaner air, better health, lower operating costs and just a few of the benefits. Planned Maintenance – A professional forklift service provider has the equipment to ensure that each engine is tuned properly and emissions are minimized. Tire Care – Worn and damaged tires increase resistance, and therefore increases fuel consumption and emissions. Operator training – Make sure your operators are trained not only to operate your forklifts safely but that they also understand the best way to operate the forklift to maximize fuel efficiency and reduce emissions. Consider adopting company policies on forklift operation, for example, zero-idle or stated speed limits. Duty cycle analysis – Have you reviewed the duty cycles of your material handling equipment lately? As pallet locations are shifted or added to your facility, your equipment is pulling some pretty long duty cycles. Ask your operators for their input. They operate these routes daily and will be the first line of defense against long runs and wasted fuel. Energy efficiency in your warehouse – There is a plethora of affordable products that you can implement in your warehouse rather quickly. We addressed warehouse energy use in our Feature Article “Keeping Energy Inside Your Facility.” Fans, curtains, windows, ceiling fans and skylights are great ways to quickly and cost-effectively improve energy production and retention in your facility. You can reduce your energy costs even further by using LED ultra-low wattage light bulbs. Some are less than 3 watts! Energy policies in the office – Writing and implementing an energy policy is a rather simple way to show your employees that you are serious about energy consumption. In addition to a paperless policy and initiative we addressed earlier in this article, there are many other small changes you can make in the office that can pay off big time over time. Lighting – Just as in your warehouse, switch to low-wattage LED bulbs in your offices and have policies about when lights are to be turned off, particularly in the evening when the office and other facilities are vacant. PC’s – Only essential computers are allowed on in the evening. Power all of them down at night and over the weekend. Be sure PC’s are set to go “to sleep” after a pre-determined amount of idle time. Toilets – Low -flow toilets pay for themselves in a few years. Thermostat – Have a programmable thermostat that changes the temperature to maximize the efficiency of your office and facility energy consumption. Encourage employee carpooling – Providing incentives is a great way to persuade employees to ride to and from work together. If you can cut the number of cars travelling to and from your facility by 20%, imagine the cost savings for the employees. Carpooling also reinforces your company’s commitment to the environment and Earth’s natural resources. Solar power – While this can be a considerable investment, it certainly will pay off in the long run. Companies will often start small with a few panels, and then add more as cash flow allows. Return on this investment is immediate and continues each and every month. There are often local, state and federal assistance and/or tax incentives to generate solar power. This article from the Food Bank in Concord California shows how this nonprofit has reduced its energy bills from about $4000 a month to $150 once the solar panels were installed. RFID Technology – If your facility or warehouse is still using paper to generate orders and track inventory, then RFID will save you thousands in not only paper, but will make your operation more efficient, accurate and profitable. RFID technology not only applies to your inventory but it can also be applied to your forklift fleet to analyze duty and use cycles as well as manage safety and track abuse. 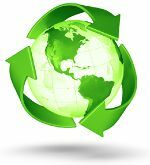 There are many things that your employees and you can do to embrace “Going Green” initiatives. Start small. Make a list and implement the measures that make the most sense for your operation. Most importantly, inform your employees of your new stance on energy and resource usage. With them on board, your job will be a lot easier. Set goals, have contests, provide incentives, make it real. Provide training where it makes sense and is needed. Toyota Forklifts of Atlanta can provide you with guidance and assist you with many of the products and services we have presented in this article to help you get on and stay on the track of energy and resource conservation. Contact us at 888-550-6836 to speak with one of our warehouse professionals.